Sadly, our blue Dobie passed away. 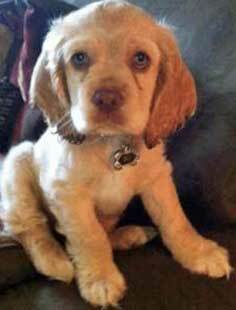 We decided on a smaller dog, so we purchased a 4 month old male cocker spaniel. Every dog we have had we have been able to potty train them within a few days or so, but our little Snickers is not so easy. I was told to crate train him, because he was so wild, pooping and peeing everywhere, even though I take him out every two hours during the day and 2 to 3 hours at night. The crate is wonderful not having to chase him constantly and he is comfortable in it. But still I will take him out and he will do his job a good percentage of the time and no sooner get in the house and he does one or the other. I take him out to the same place and tell him to potty and praise him. He doesn't get as much exercise as I know he should because it is winter and 0 to 20 degrees. I have read Ceaser's books and have been researching. Trying to teach him to sit and stay is also going nowhere and I am a quite patient and persistent person. Do you have any suggestion for me? He is absolutely not interested in treats when I try to reward him with them outside. I walk my other dog faithfully, winter or summer, wondering if coat and boots would be okay, or if he is still to small for such cold weather? I so sympathize! I had the same problem as you. My puppy just refused to 'do the business' and then had accidents in the house. I was so frustrated until a friend (who used to be a cocker breeder) gave me this little tip. She recommended that when I took my puppy out into the yard to pee I didn't play with her or talk to her other than to encourage her to pee. She said that I had to let my puppy know that there was a time and a place to play and this wasn't it. So, when I took her out I told her to pee and just stood there and waited...and waited...and waited...and eventually she did! I praised her so much and gave her a little treat. Once she realized what she was supposed to do, she started doing it. I sometimes think it's us that needs the training, not our dogs. Good luck and I hope this works for you too. I have a girl Cocker Spaniel and she is 9 months old. I take her out 5 to 6 times a day, feed her in the morning and the evening. Sometimes she can go 4-5 days without an accident, then she starts peeing and pooping wherever and whenever she feels like it and this can go on for days at a time. Whenever I take her outside, she always pulls and jerks at the harness wanting to go further, I spend 30 to 45 minutes out with her each time I take her outside, what am I doing wrong? You'll find the article on puppy potty training here. You might also like to try these exercises from scratch - keep at it - your puppy will get there in the end! I take my cocker puppy out every hour. There is an article in here somewhere (sorry, I'm not sure where I read it) which recommends taking your puppy outside every hour, after playing, after any form of exercise or excitement, and also immediately on waking. During all other times, it's best to keep your puppy crated to keep him out of mischief. Try taking your puppy outside more often - I'm sure you'll see a big difference. If I see him go, I praise him and when we go in, I let him run where ever. If, however, I don't see him go, or if he doesn't like the weather and refuses to go out, I put a diaper on him. Now when we are outside he runs right over to me to go, to show me he did his business. And he licks my face even if I am asleep to ask to go out.